How to file bankruptcy in Virginia is the biggest question we get on our website chat and e-mail inquiries. Many people understand an attorney is required but want to understand what the process will entail. If you ask a layman how to file bankruptcy, the answer might be simply be “you have to file paperwork at the bankruptcy court but watch out you will lose your property.” They would be wrong on both counts. As a result of the changes in 2005 to the bankruptcy code the requirements to file have grown. Now you are required to complete a credit counseling course before you file and a financial management course after you file. 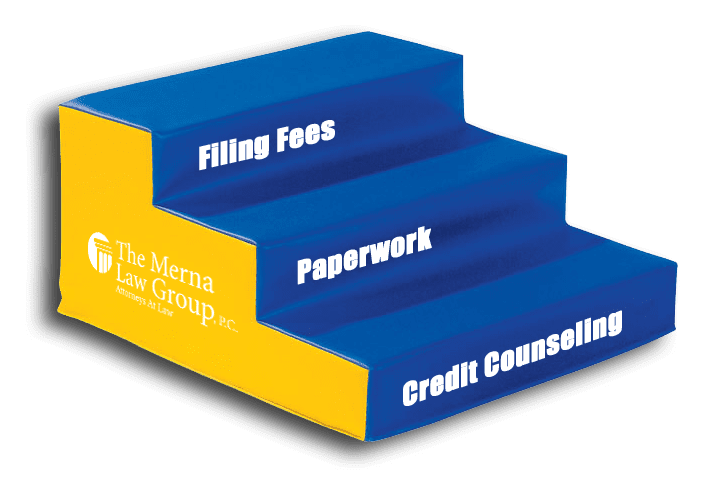 So to answer the question “how to file bankruptcy in Virginia?”, step one is to complete a qualified credit counseling course and get the certificate which must be approved by the local bankruptcy court. The course you complete must be approved for your jurisdiction. For our purposes the proper jurisdiction is the Eastern District of Virginia. You can find a list of approved credit counseling agencies through the U.S. Trustee’s office or more appropriately through your bankruptcy attorney. Prices vary from around $16 to $55. The course takes about an hour to complete online. Relax it is not that difficult. How To File Bankruptcy – Step 2 – Fill Out The Bankruptcy Petition. Completing the required 40 to 50 pages of bankruptcy paperwork is the next step which brings up a whole new question which is how to fill out and file the bankruptcy paperwork. That is a much longer blog. So stay tuned. How to complete the bankruptcy petition is probably the second most asked question. We make it simple by doing it for you. That is part of the value of an attorney. The real value is that not only do we do it right so you don’t lose any property but we do it so well it will help you in your credit recovery. No kidding. I had a former client who was applying for a home loan a year after filing bankruptcy tell me that her mortgage processor commented that her credit report was the best post-bankruptcy credit report she had seen. (See information on Our Accelerated Credit Recovery Program). The mortgage processor said her attorney did such a good job that all the negative accounts had stopped reporting. According to the mortgage processor, in her years of reviewing post-bankruptcy credit reports more often than not the attorney did a sloppy job of notifying creditors and the client suffered by having continued negative credit reporting even after the bankruptcy. The lesson here is not all attorneys are doing the job equally well. Step three of how to file a bankruptcy is to pay the filing fee. The current Chapter 7 fee is $306 while the Chapter 13 fee is $281. The court will accept payment of these fees in installments. However, beware. If you miss an installment payment your bankruptcy will be dismissed. Well, I hope you enjoyed this very general introduction on how to file a bankruptcy. But I will leave you with one warning which is “invest” in an attorney with credit recovery as a goal for you. As you have seen in this blog, the quality of an attorney varies and you will not know until it is too late whether you have a bad one. It goes without saying that should you mistakenly try to file a bankruptcy on your own you may complete the process but you will undoubtedly make many of the mistakes that poorly trained or careless attorneys make. These mistakes will hamper your credit recovery for years. This is why I say “invest” in a bankruptcy attorney that has your credit recovery as the goal not rushing you through a bankruptcy case. You will save this investment ten-fold over the next ten yours through quicker credit recovery, lower interest rates, and fewer problems renting, financing, applying for security clearances, and applying for jobs. Author’s Note: This blog on “how to file bankruptcy”stops at the point of filing. The process of successfully completing a bankruptcy, protecting your property, defending challenges, avoiding dismissal, etc., is much more complicated and should be left to your attorney. TO SCHEDULE A FREE BANKRUPTCY CONSULTATION CLICK HERE!